Whenever North Korea hits the news, people are able to have a laugh at its expense. Its behavior is akin to a screaming toddler at a supermarket who has been told that it cannot have candy; one of steadfast defiance in a situation that can only be won if the other side cedes. On the surface, their belligerence, constant threats of violence, and grandiose claims are all comical. Underneath this all lies societal problems and numerous human rights violations, which are often overshadowed by the country’s grandstanding. North Korea has reworked its constitution to label itself a nuclear state, and satellite images are showing increased activity in an area that will soon mark North Korea’s third nuclear test. Most people have heard North Korea’s nonsense far too many times to pay them any attention. North Korea has determined that they must detonate another nuclear weapon to get aid, because it has worked twice in the past. The world is growing tired of this child saying “no” and are beginning to realize that rewarding bad behavior only encourages more bad behavior. 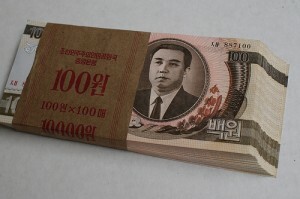 So, is austerity the answer on the Korean Peninsula? Should all aid be cut off and North Korea’s government be left to atrophy until a policy change occurs or new leadership takes over? Such actions would only hurt the general populous first, as Kim Jong Un obvious eats the largest part of food aid, with high ranking officials getting leftovers, and the military receiving just enough scraps to keep them from launching a coup. Cutting off aid temporarily and hoping that the country changes its policy hasn’t worked any of the previous times, nor has increasing aid for that matter. Being strict with North Korea and holding back food aid is condemning their population to death, and now more than ever they are in a difficult situation with this year having the least rain in over 60 years. Food is scarce, and it will become more scarce. It would be hypocritical to bash North Korea on their history of human rights violations, all while turning a blind eye while their people starve due to withheld aid. Other means of helping influence policy reform from within North Korea must be taken. For years, messages have been floated across the DMZ via balloon, and VHS and cell phones have found their way into NK from China, and so people are more and more aware of the outside world, but through lifetimes of propaganda and fear of landing your family in a work camp for insulting the regime, people remain relatively subdued. The next step is giving the North Koreans a constant stream of information and a chance to communicate with the outside world. The next tactic should be satellite-linked smart phones with solar panel chargers floated over on balloons. Although incredibly costly, a North Korean getting their hands on a Samsung device, and using it to contact real people in the outside world for support, encouragement, and ideas, would be the first step towards the general population rising up and taking back the food that has been denied of them. With a population of 25 million, with 1 million being active members in the military, it would take considerable amounts of phones sent over to create a difference. If worse comes to worse, they could always sell the phones and buy food on the black market.